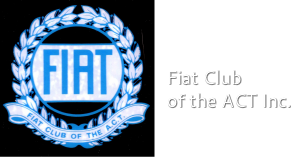 ​The Fiat Club of the ACT (Inc) is dedicated to bringing together those who love Fiats and Lancias. You can contact us by email: fiatclubact@yahoo.com.au or by post: The Secretary, PO Box 1119,Canberra City, ACT 2601. This is French film-maker Claude Lelouch's short 1976 film - Rendevous - an early Sunday morning, high speed, single shot take through the streets of Paris. There's a fair bit of information on the web about the film, and it was documentary maker Richard Symons who convinced Leouch to restore the original 35mm print and release the film (now distributed by Symons' Spirit Level Film). Rumour has it the film was shot from a gyro-stabilised camera on the front bumper of a Mercedes-Benz 450SEL 6.9, with the audio from Lelouch's Ferrari 275GTB later dubbed in. Unless I'm mistaken there is a very brief appearance of a FIAT 1500 which will please our Club Captain no end (look for the swerve around the garbage truck).